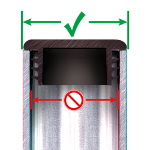 Please make sure you measure the outside of your tube when referencing our sizing information. Also, note the "Tube Wall" specified for each plug to make sure it will be compatible with your particular tube. RCM Series Tubing Plugs Available in Sizes to fit Metric Rectangular Tubes. SQM Series Tubing Plugs Available in Sizes to fit Metric Square Tubes. RNM Series Tubing Plugs Available in Sizes to fit Metric Round Tubes. RCS Series Tubing Plugs Available in Sizes to fit Standard Rectangular Tubes. SQS Series Tubing Plugs Available in Sizes to fit Standard Square Tubes. RNS Series Tubing Plugs Available in Sizes to fit Standard Round Tubes. 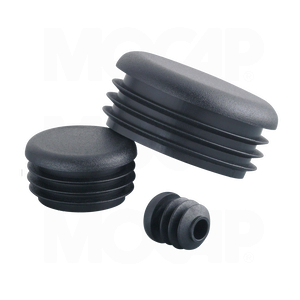 MOCAP RNM Series heavy wall polyethylene plugs for round metric tubing are designed to fit multiple tube gauges and provide a secure fit. Poly tube plugs are ideal for office and patio furniture, tubular racks, appliances, exercise equipment, or anywhere a finished look is needed. Tube plugs include multiple horizontal ribs designed with built in flexibility for easy install and secure fit. RNM Series Tubing Plugs are available in sizes to fit 10mm to 102mm metric round tubes. Also available to fit Square and Rectangular tubing. Many Sizes of Our Plugs for Round Metric Tubes are Stocked for Immediate Shipment. Sizes Available to Fit Standard and Metric Tubes.